Let me begin by giving you a puzzle. Close your eyes and imagine a romantic moonlit scene, alone with your crush. Suddenly your crush turns to you, with a serious expression, and blurts out a confession of their feelings for you. What phrase do you imagine them saying? There are plenty of choices here; think of a few. Okay, now imagine a rather different scene: You are playing a life or death game of dodgeball against some pirates inside a video game (look, it happens). You believe you have the power to defeat the evil pirates once and for all, but in order to hit the ball with your full power you need your best friend to be the one holding the ball for you. You have to tell this to your other teammates. What do you say to them? Here’s the puzzle: What if the answer to both of these questions has to be exactly the same sentence? Completely verbatim. Can you come up with one sentence that fits both scenarios? I’ll give you a few paragraphs to think about it before I come back to this example. Translation is notoriously impossible. That’s not a new and shocking thesis; any text worth its salt makes use not just of the direct meaning of words, but of dozens of other dimensions of language — sound, cadence, cultural allusions, double entendre, deliberate ambiguity, the ordering of information, and so on and so on. It’s an amusing little cocktail party fact that the first line of the Odyssey could in theory be translated as “Tell me, O Muse, of a cheating husband,” but it’s also a good example of the sort of semantic layering that’s usually impossible to capture when you port a work from one language to another. Translators drive themselves crazy over these tiny details in order to best capture not just the meaning but all of the overtones of a line. I use the word “overtones” here very deliberately: The image in my mind when I think of all the different layers to a word or sentence is that of all the different frequencies that actually make up a note, overtones layered onto the fundamental frequency. Playing a piece of music on an instrument it wasn’t composed for will inevitably change the subtleties of the pitches and harmonies, since different instruments create overtones in different relative strengths and duration. Similarly, translating a text into a language it wasn’t written in inevitably changes the exact resonances of the words and sentences. These difficulties are by no means unique to queer stories, but queer stories provide an extremely fruitful ground for examples of translation conundra that are complicated and consequential. Queer themes and relationships are so often conveyed largely through these harmonics (as well as other non-linguistic techniques: expressions, body language, symbolism, etc. ), and without careful attention those nuances can easily be bulldozed over in translation. And even with the most careful attention possible, there are still so many examples in which no English equivalent exists that can possibly perform all of the different roles of the original. Of course everything else about this scene contradicts whatever assumptions are baked into the language… a dissonance that’s clearly, uh, deliberate. 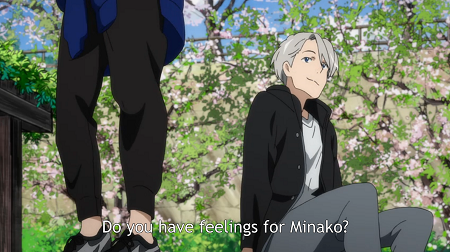 Within this context, I have some sympathy for the translator’s decision to go with “girlfriend.” There already is explicitly gendered language surrounding Viktor’s questioning, and within a heteronormative culture, “girlfriend” is going to match the actual semantics of what both the speaker and the listener (and audience) perceive the majority of the time a man is asked whether he has a koibito. 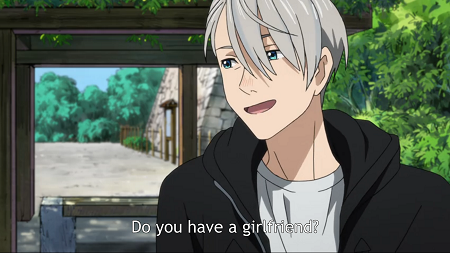 To make a more marked gender neutral choice in English changes the overtones: If Viktor says “do you have a lover?” (as he does in the dub) that reads in English as a self-consciously inclusive and ambiguous word choice, which subtly shifts the characterization and is also expressly at odds with “is there a girl you like?” from the earlier scene. It sends different signals to both Yuuri and the audience. 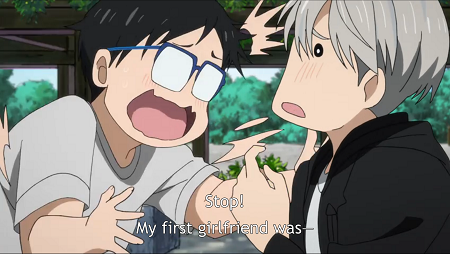 When Viktor’s being nosy about Yuuri’s life, given that he used gendered language in a previous scene it’s defensible, if suboptimal, to use “girlfriend.” But when Viktor’s giving factual details of his own past, suddenly the English translation contains claims that just aren’t made in the original Japanese. The task of translation here is to find a way to phrase each of these lines that accomplishes a) sounding unmarked, not like a conscious effort to be ambiguous, but also b) actually preserving the gender-neutral meaning of the original text. The point is that even a relatively simple example of translating one word has many layers to untangle: How are the characters perceiving the word? How is the audience intended to perceive it? How might that perception change as the characters and story are developed? What nuances or ambiguities are built in by the writers that might be invisible to the characters or much of the audience? And so on. In this case I think that translations are possible that preserve the dynamic pretty well (I would have gone with something like “Are you seeing anyone?” and “My first relationship was…”). But there are plenty of examples where no solution to the puzzle may exist in English. Those cases, the impossible ones, are the examples I’m obsessed with collecting. How are you doing with the dodgeball puzzle? Hopefully you’re struggling with, among other things, the fact that I asked you to come up with a sentence that makes sense both addressed directly to someone and said to a third party. There might be creative ways around it, but English doesn’t really do that. Okay, half credit if you can do it with only one word change that moves from third person to second. Keep thinking. As many of you probably already know, this dodgeball example comes from the 2011 Hunter x Hunter anime, and is my personal favorite go-to example of a line whose overtones I don’t know how to preserve in translation. (If you haven’t watched Hunter x Hunter, go watch it. I’ll wait. You can come back here when you’re through episode 70. …Okay actually you can keep reading, but be warned of mild spoilers, nothing big. Then go watch it later ’cause it rocks.) Hunter x Hunter is largely focused on the friendship and budding romance of the two leads, and in particular Killua (the white-haired one) spends much of the middle of the show mired in that classic teenage angst about what his feelings are exactly and how Gon (the black-haired one) sees him. During the, well, as I said, life-or-death dodgeball game against some pirates, Gon explains to their teammates that he wants Killua to hold the ball up for him to hit, rather than one of the older, more experienced players. The scene starts at around minute 19 of episode 70, and you should go watch it right now; the voice acting and music are a large part of the effect. Gon: Booru wa Killua ga motte-kurenai to. Killua ja nakya dame nan da. There’s nothing incorrect about the subtitles. Both of Gon’s sentences here use some form of a negative conditional, typically translated as “has to/must/needs to.” The first sentence is literally “If it’s not Killua who holds the ball for me…” — the continuation “that wouldn’t do” (ikenai) is often left implied. 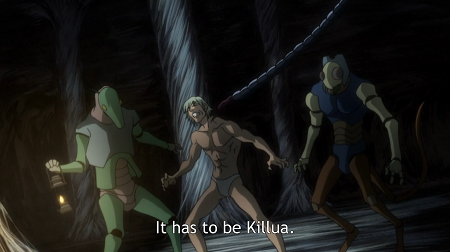 The second sentence is similar in form but contains the full conditional: “If it’s not Killua it won’t work.” The subtitles say the same thing more idiomatically. Notice that these two sentences are redundant. Sure the second one emphasizes the point more firmly by repeating it, but it’s making exactly the same claim. But watch Killua: He doesn’t react to Gon’s first sentence at all, but at the second he gasps, followed by a couple seconds of a startled expression and audible breathing, then later smiling and hiding his eyes under his bangs. To understand that reaction — both the intensity and the timing — we need to understand some of the other frequencies resonating along with Gon’s line. “~ ja nakya dame nan da,” in a different context (say, the romantic moonlit scene from the first paragraph), serves idiomatically as a confession of feelings; picture something like “you’re the one” in English. (For data on this, note that Google searches for the phrase turn up some combination of romantic songs and forum posts asking for advice about confessing love to someone.) To be clear, this phrase is not romantic in all contexts, and Gon is not using it romantically here; what he’s saying is sweet and adds depth to their relationship, but he is in fact talking about the game of dodgeball, not making a specifically romantic declaration. 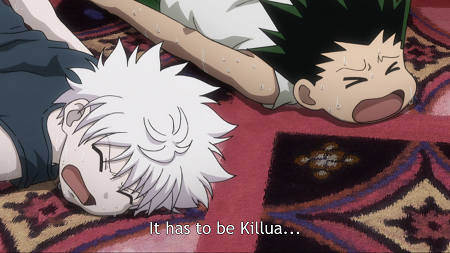 His choice of phrase still has meaning, however, for the audience and clearly for Killua. While the sweetness of the sentiment is maintained, that additional layer is lost in the English phrasing. 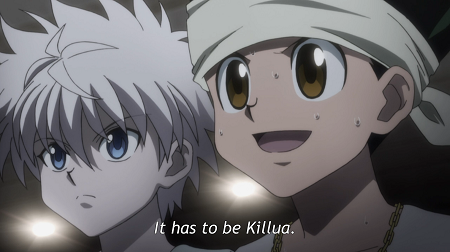 The translation changed, from “he’s the only one who can do it” to “it has to be Killua.” That’s not some huge failure on the part of the subbers; they translated it to fit in context in the original scene, and it needed to be a bit different to make sense as a standalone line. Reasonable enough, but the fact that they had to change it emphasizes the point that the original translation wasn’t performing all of the same functions as the Japanese line — one of those functions was to stick in Killua’s memory as a pivotal sentence in the history of their interactions, and the original English didn’t carry enough weight for that. “It has to be Killua” is closer — not quite there, but closer — to being an answer to the puzzle; “it has to be you” is at least a phrase with romantic resonance in English, albeit a bit dated sounding. But the grammatical differences between English and Japanese still prevent this from being a real solution, because to get the romantic reading you have to make the leap to imagining the same sentence in second person. 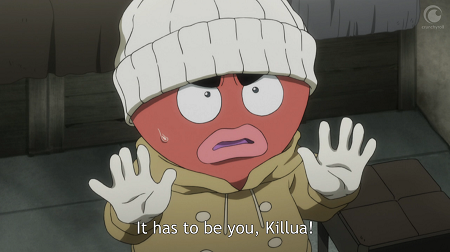 In Japanese a name is often used in place of a second person pronoun, so no change to the wording is necessary to imagine it addressed directly to Killua. Gon: Arya?! [Hey!] …Killua ja nakya dame nan da! Gon: Killua ja nakya dame nan da! What makes this example so interesting to me isn’t that I think the subbers got anything wrong, but that I don’t know how they could have done better. No English phrase that I can think of is capable of playing all the roles that this line needs to play. (If you’re curious, both the dub and the manga translation go with “I can’t do this without Killua,” which works fine in the original scene and in the flashback, but also lacks the specific romantic resonances. The Next Time previews are unique to the Japanese anime, so I only have the one official translation of them.) The repetition and focus on this one line, both within the narrative and in the Next Time previews, shows that the writers (and Killua!) see it as important, so it’s worth obsessing a bit over how to capture all the layers… and I just haven’t come up with anything very good. It needs to be explained in English rather than just experienced; and much like attempting to dissect and explain a joke, much of the visceral effect is lost. Examples like this are much more than a fun linguistic puzzle. We still live in a world so steeped in heteronormativity and homophobia that many, many queer stories do this dance of hiding in plain sight, taking form and substance largely from overtones rather than having characters stare into the camera and say “yo I definitely identify as homosexual.” But those overtones, those harmonies and layered meanings, are just as intentional and intrinsic to the story as the level one dictionary definitions of the words in the dialogue. Preserving that texture in translation is incredibly difficult, sometimes impossible. But it’s imperative to at least try. Do you have other good examples of this phenomenon? I’ll be doing a series of articles dissecting as many specific examples as I can collect, and I would love to hear your favorites! And as always, disclaimer that I am not a native speaker; I used to live in Japan and have been studying the language for fifteen years, but I absolutely might overlook important nuances or lack knowledge of colloquial connotations. This stuff is the most fascinating thing in the world to me and I care about understanding it accurately, so please let me know anything I miss.